This entry was posted in Uncategorized and tagged cuisine, food, Look Rok, Sausage, thai by christao408. Bookmark the permalink. I love SE Asian sausages. Very good flavor, imo. I’ve never seen this before though, it’s interesting and pretty for sure. Hmmm I’ve never tried that. What is the dish called? woah interesting. I wonder how the texture is?! Looks quite yellow for egg no? Never tried. I will put it in my order the next time I go out to eat. Looks good… if only I didn’t know about the casings! Hah! Looks good. I’ll have to try making some. I’d say worth the effort. Very pretty, indeed. Just egg? I think I’d forego the trouble and just make scrambled eggs. hehe. It is pretty… Are you going to give it a try? huh… interesting. seems much easier to make than an actual sausage, but more time consuming than just scrambling eggs as val pointed out! Always liked the sausage…what is the one from Laos called…very strong garlic in that one! @Gentemann – Are you thinking of sai grog? @kunhuo42 – @murisopsis – Yeah, if you are going to poach or boil or scramble an egg, why stuff it in an intestine first? @Inciteful – The good news is that these days you can buy it in the store, albeit in an artifical casing, not an intestine. @Toro69 – Let me know how that works out. @ZSA_MD – Um, I would suppose you could use non-pork casings, too@Fatcat723 – Yeah, let’s see if you can find that locally! =D@yang1815 – Lots of healthy things for chicken to eat here. @I_love_Burma – the soup is called “gaeng joot look rok”, literally “bland soup with look rok”. @arenadi – It certainly isn’t the most common type of sausage out there. I wonder what would happen if you made a sausage of boiled egg and ground meat, kind of like those Scotch Eggs? 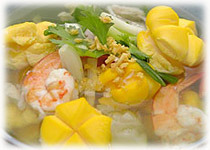 @CurryPuffy – Head to Thai town and see what you can find. Oh that’s so interesting. At first I thought it was some type of tofu. What is the texture like?